If you have multiple students using Writing With Ease, this additional set of Level 1 Student Pages will save you loads of time and work! 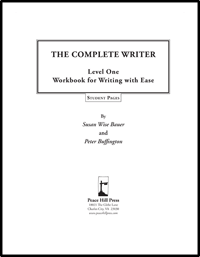 The Writing with Ease Level 1 Workbook already contains one set of Student Pages. If you need additional Student Pages for use in your family, you’re free to make copies from the Workbook. Many parents find it easier to skip the photocopier and simply purchase this additional copy of Level 4 Student Pages. The text for the narrations are included, however instructions for the parent or teacher are not included in these Student Pages. Those instructions can only be found in the Workbook. Megan, it’s 144 pages (plus a title & copyright page, which you wouldn’t need to print out). I have two children that I will be teaching this too and I’m trying to decide if I need a workbook and student pages for both of them. Thank you for your help. You don’t need to get two workbooks. The workbook contains the instructions in the front, and one set of student pages in the back. So you could purchase a workbook plus one set of the student pages, and that would be sufficient. One student would use the student pages that are contained in the workbook, and the other would use the extra set. 2 out of 5 PDF Version of student pages aren't the same quality dimension as the printed version. The PDF version of the student pages aren’t of the same quality because the margins are different and the font is smaller so there is less space to write on the page. I am more disappointed with this because it never specifies that in the description. 🙁 I don’t see the reason for not making them the same quality if we are paying for it. The font on this product should not be smaller than the font on the physical product; there may have been some error when the file was downloaded or printed. Please contact us at [email protected] and we will help you fix this issue. The sample link is not a PDF nor a sample? I have a sixth grader who probably has dyslexia and dysgraphia. I know he needs to start at Level I – based on my review of the materials. Do you think we could skip part of Level 1 and move more quickly to Level 2? I am hoping to do both Levels in one year. What do you think? Yes, that would be fine to do.